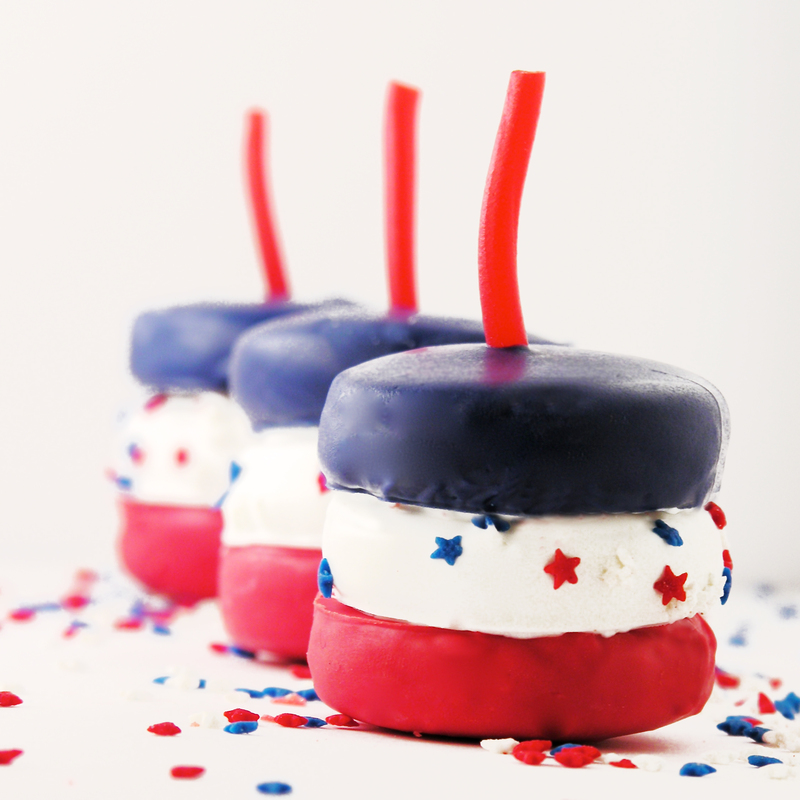 These fun little fire cracker cookies have a crackling surprise inside– pop rock candy! 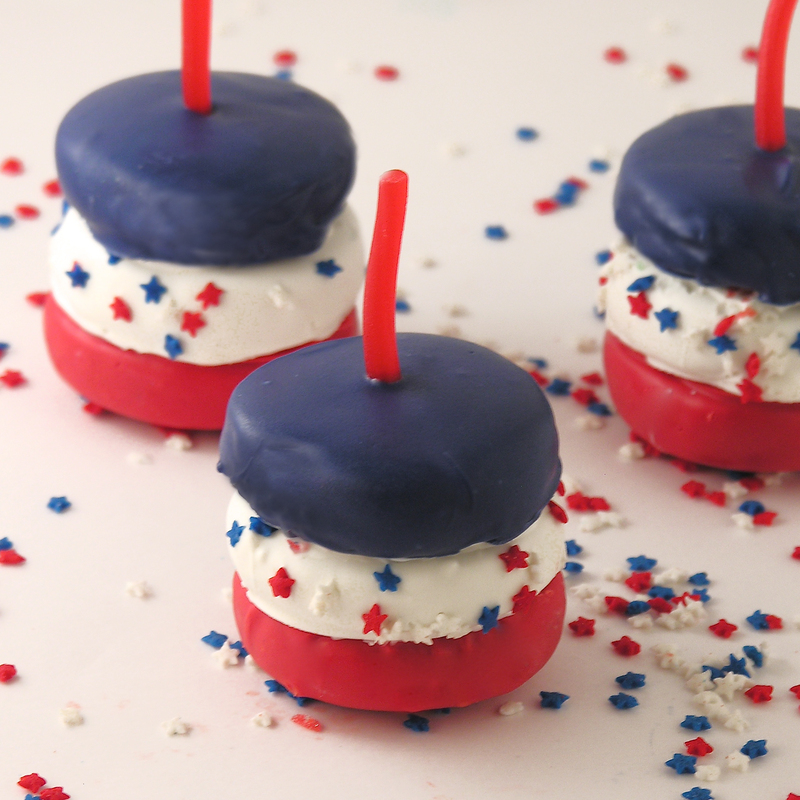 A perfect treat for your Fourth of July celebrations!!! I can’t believe it’s almost July already- this summer is passing too fast…! These cookies were a HUGE hit among my friends- the experience of eating a cookie that is popping in your mouth is truly a unique one, and everyone was a huge fan! I adore sugar cookies…especially in the summer. They are so…expected at Christmas- but the 4th of July? Such a fun treat! These are easy to make and cut just beautifully. 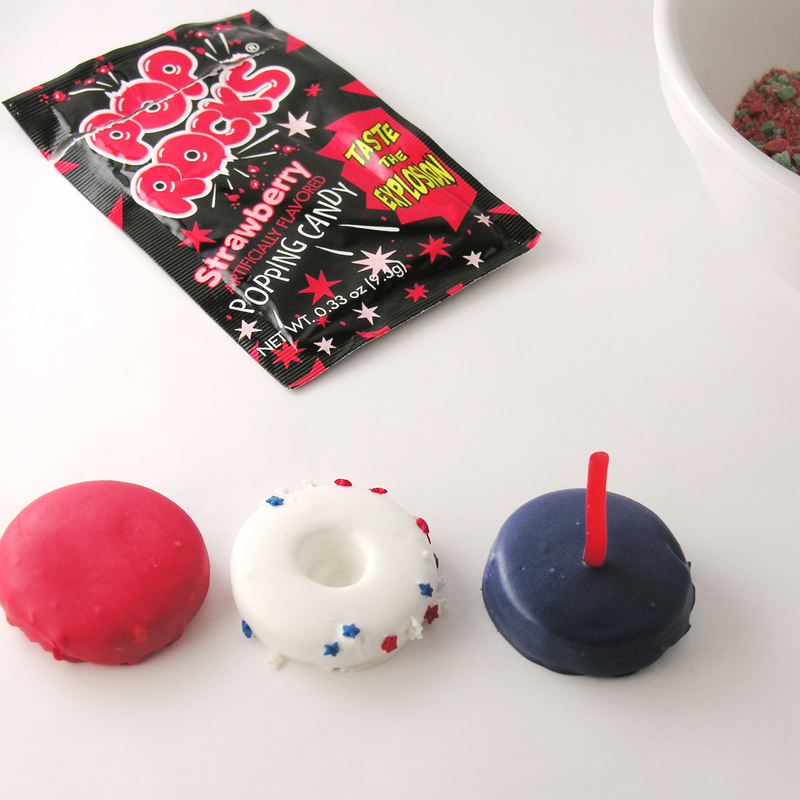 The dipping in candy melts takes a little time, but the end result is just so fun! Use a smaller circle cutter to cut out a center circle from 20 of these cookies. Place cookies on cookie sheets covered in parchment paper and bake at 350F degrees for 8 to 10 minutes. Slide baked cookies and parchment paper together onto a counter to cool completely. Melt candy melts in microwave in 30 second increments, stirring in between until smooth. Dip 1/3 of cookies into blue melts first and allow them to harden slightly before setting a snip of licorice on top. You may need to experiment with this a bit. The melts need to be soft enough to stick the licorice in, and hard enough to hold it upright. Dip remaining cookies- 1/3 into red and 1/3 into white melts (add star sprinkles on the sides of the white cookies) and allow them to harden completely. Put the cookies together by piping or spreading a little white candy melt on the bottom of the white piece and setting it on the red. 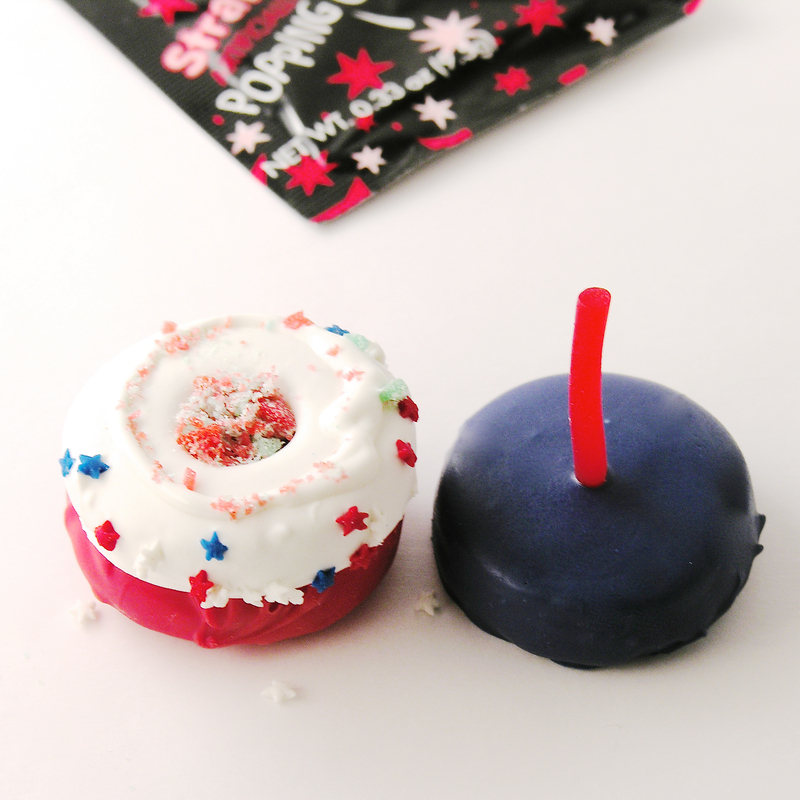 Fill the open spot in the white cookie with pop rocks, pipe or spread a little white candy melt on the top ring of the white cookie and set the blue cookie on the very top. Allow cookies to harden together. Enjoy!! My thoughts: These take a little time, but they are genuinely fun to make and SO fun to serve! I loved the giggles at those surprise Pop Rocks in the middle!!! I hope you get a chance to try them!!! 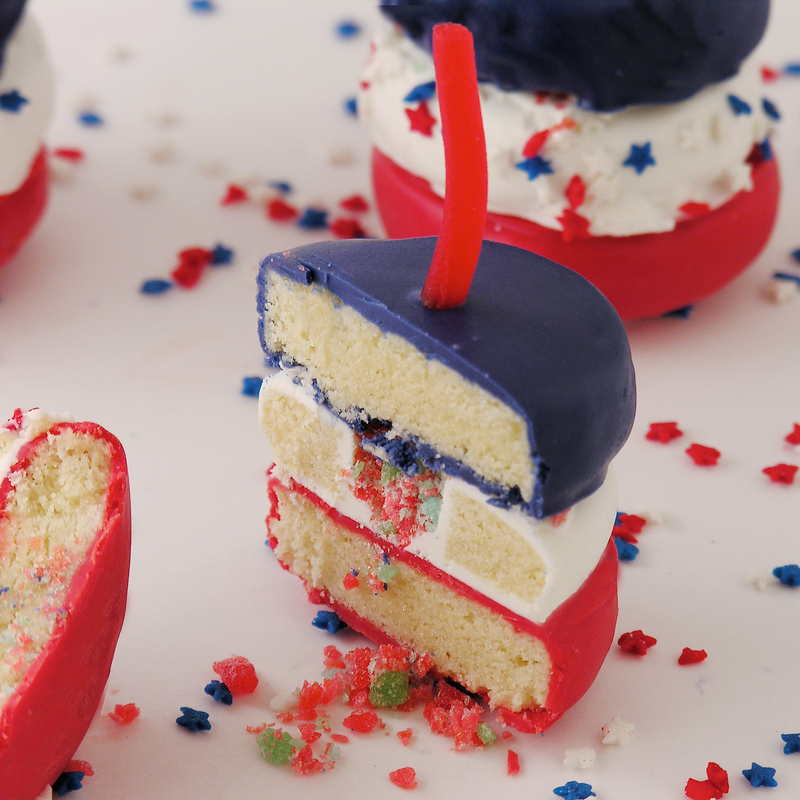 Posted in Cookies and tagged cookies, cookies for kids, dessert, firecrackers, fourth of July, fun, independence day, patriotic, pop rocks, recipe, stars and stripes, Wilton candy melts. Bookmark the permalink. Adorable as always! You have the greatest unique ideas!! !